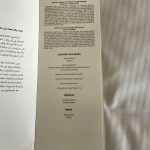 British Airways First vs. Etihad Business. 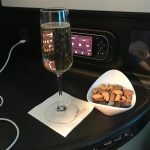 I’d originally intended this post to be a simple review of my Etihad flight from Zürich to Abu Dhabi, but the more I reflected over my experience, the product similarities between British Airways’ First class and Etihad’s Business class were too numerous not to compare. 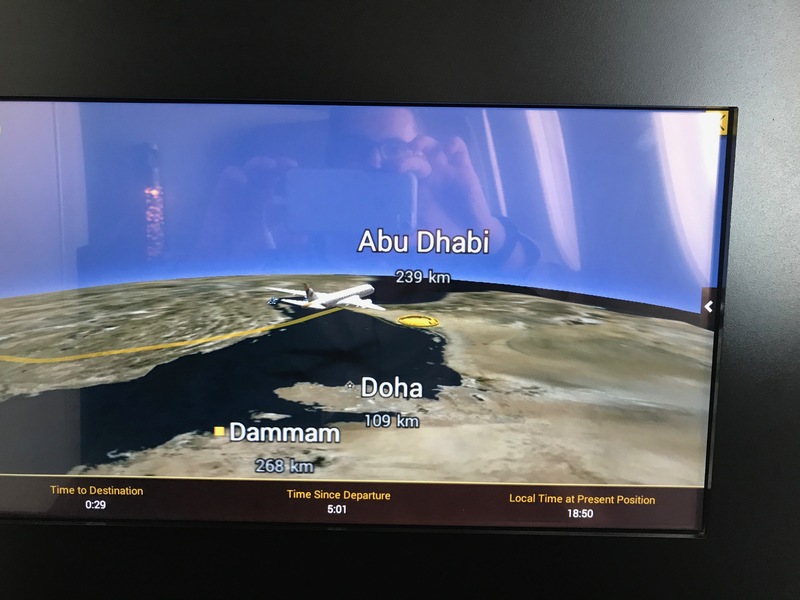 I flew on Etihad’s 787-9 from Zurich to Abu Dhabi. 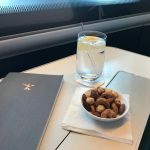 They have it outfitted in a three class configuration with First, Business and Economy. I was in Business and seated in 7K. 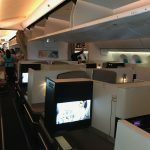 I’m comparing this against my most recent BA First flight, from Sydney to Singapore on a 777-300ER where I was sat in 1A. 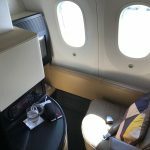 I feel somewhat bad in the fact that I don’t have a photo of the BA first cabin (and would rather not use someone else’s), apart from selfies (oops)! However both are outfitted in a 1-2-1 configuration. 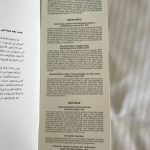 Below are some photos of the Etihad seat. The BA seat is slightly larger and more private. It also comes with a mattress pad and duvet, however for the day flight that I was on, didn’t use any of those amenities. Etihad only had a blanket, which also remained unwrapped due to it being a day flight. 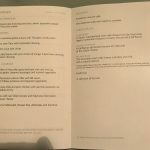 In terms of food, this is the BA menu. 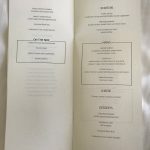 On paper, the British Airways food menu looks superior from both a food and wine perspective, as you’d expect for a First versus Business class comparison. 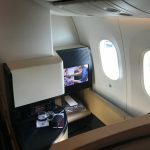 The British Airways flight also has the advantage at being 7 hours 50 minutes, as opposed to 5 hours 30 minutes for the Etihad one, so not quite apples to apples. As both airlines flight London to Abu Dhabi, accept that would have been a far better basis for comparison. 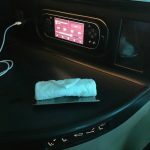 The Etihad flight started with a thick, scented cold towel, served on a dish. The British Airways one was a thin, hot one, served on the cabin crew’s tongs. Etihad wins. In terms the post departure beverages, here’s the two side-by-side. Tanqueray Ten and tonic and Billecart-Salmon. 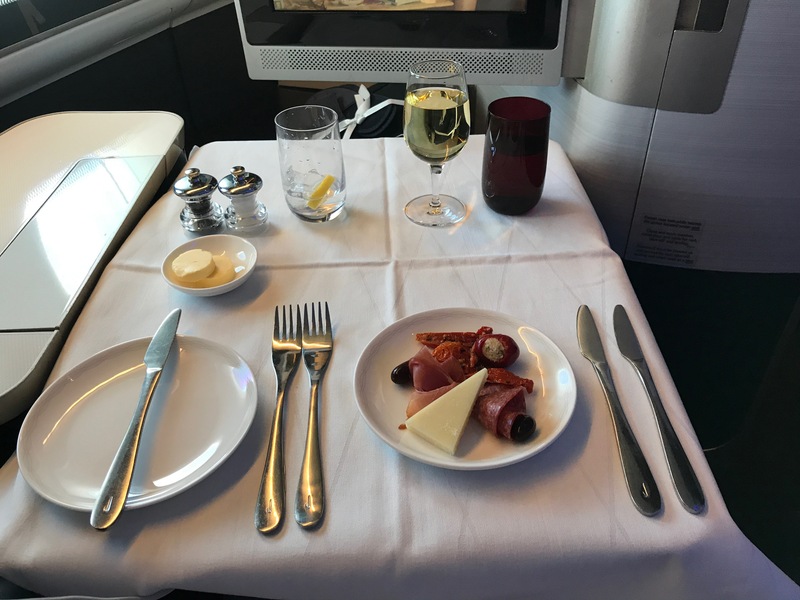 British Airways served an amuse bouche, where as Etihad did not. 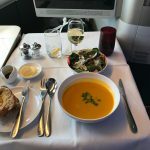 The starters were soup and salad on British Airways, or a mezze plate on Etihad. 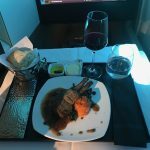 For a main courses I had chicken with BA and lamb loin on Etihad. I must confess to having skipped pudding on my BA flight as I was still pretty stuffed from the Qantas First lounge. However pictured below is the Etihad dessert. 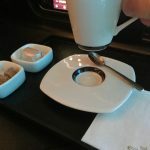 Both airlines have espresso available (BA don’t in business) and this is how it’s served on Etihad. Etihad finished the service with a hot towel. Overall in terms of the quality of the food, Etihad wins by a country mile. The lamb in particular was delicious and clearly of high quality. It was also perfectly cooked and pink in the middle. 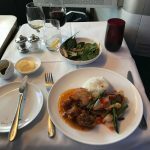 The BA main tasted a bit like a M&S microwave meal would. In terms of beverages, it’s closer. BA absolutely have the edge in the wines and champagnes. That said the NV Billecart-Salmon that Etihad serve is a lovely drop, but not up there with the Laurent Perrier Grand Siècle. 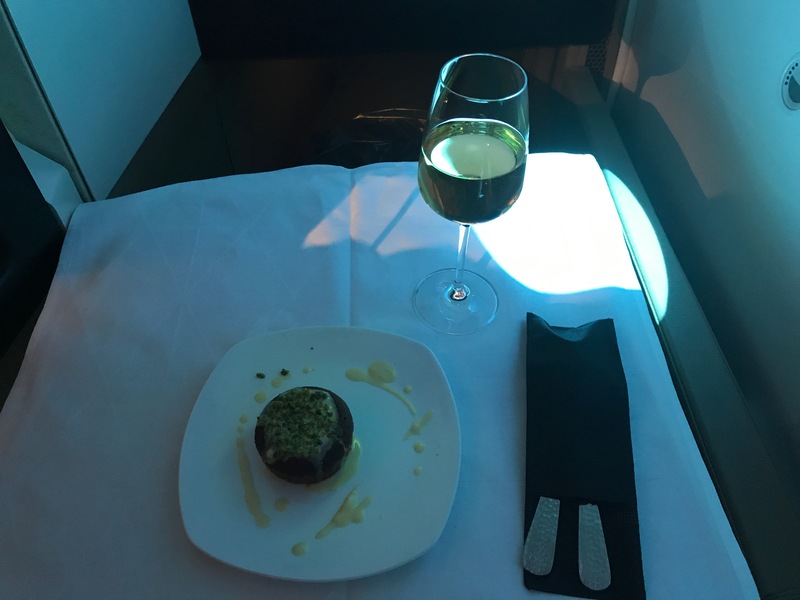 The quality of the main wines on Etihad Business simply wasn’t up there with the BA first ones, but they weren’t bad. Both products had dessert wines available. In terms of spirits Gin and Tonic is my poison and BA serve Tanqueray Ten. Etihad serve Caorunn which is arguably better and less mainstream. 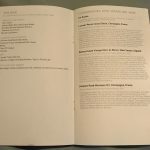 Overall a slight win to BA, but only due to the wine list – if you’re a spirits drinker, then they’re even. 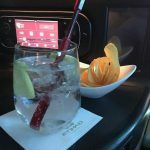 Below is the Etihad G&T, served with some crisps (chips) and the end of meal hot towel. In terms of the fit out of the aircraft, again I’d give the edge to Etihad. 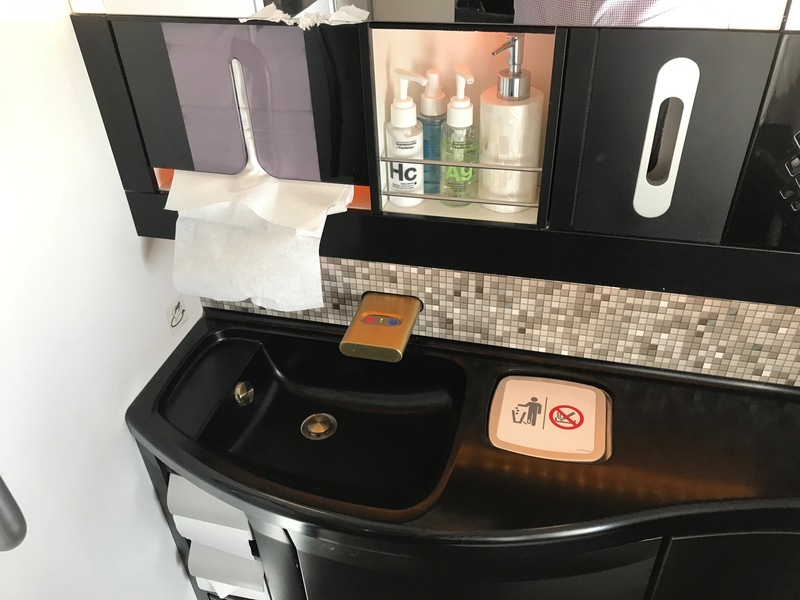 Their business class toilets are larger than any of the BA first class toilets on any of their fleet currently in the air. They also have facial mist and alcohol hand gel in addition to hand wash and moisturiser. BA only have hand wash and moisturiser. Other details I noticed is that that headphones on both were poor. 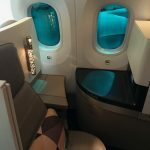 The Etihad ones especially so with no audible noise cancelling – the BA ones did have this. I switched to my Bose QC20s. 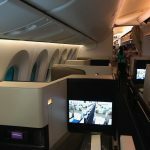 Being a brand new aircraft, the IFE on Etihad was excellent. Fast, responsive with a huge selection of movies and a larger screen that BA first (on the 777/747 seats). They’re about equal on the 787 seats. Etihad also had Wifi available on the 787-9 and most of their fleet. BA are still outfitting theirs and currently I believe there’s just the one test aircraft flying. In terms of the service from the crew, again Etihad were top notch and couldn’t fault them in any way. The BA crew were lovely and meant well, but had to explain when I asked for the white Burgundy, that I meant the St. Aubin. 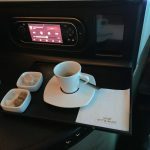 I must say that overall the Etihad product is really excellent and absolutely compares with British Airways first class. I’ve consciously not compared the ground products here either, as lets face it, that’s where BA is weakest. So overall I guess it depends what you value. The service on both was good. Both products are equally private with a little more room and comfort on BA, but not hugely so. 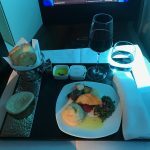 The food is undoubtedly superior on Etihad. Wines are better on BA, but spirits are both equally good. 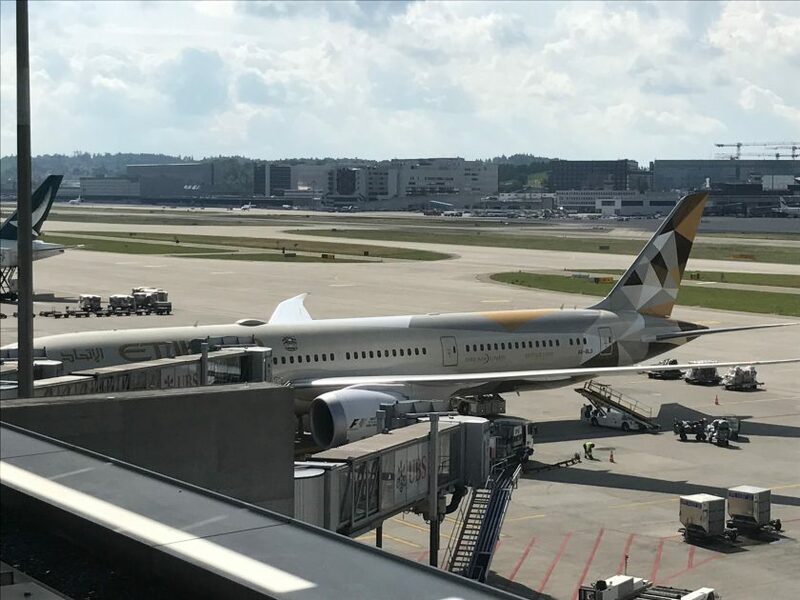 IFE and connectivity goes to Etihad. Overall, if I had to choose, I’d probably pick Etihad if I had to fly tomorrow. 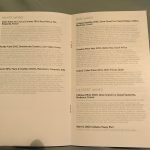 It may seem surprising, but I guess it shows how little BA have invested in the overall experience. 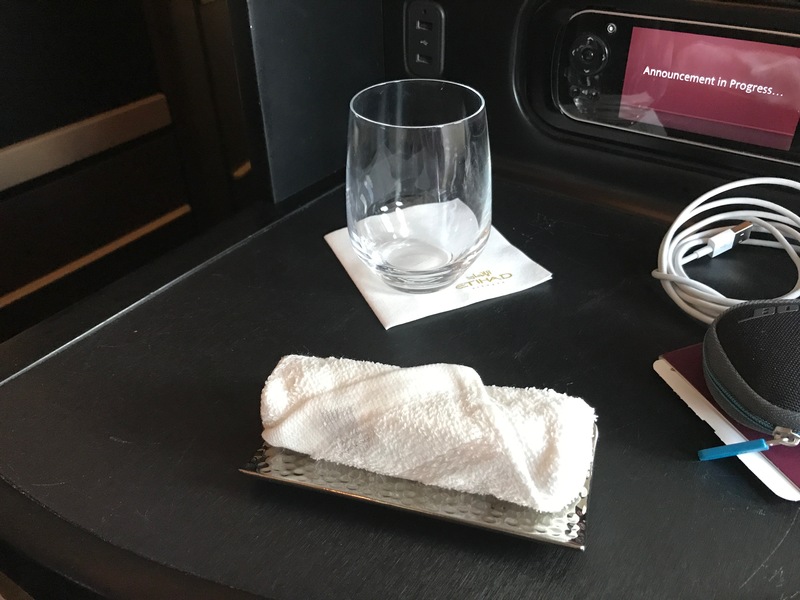 I believe it was Ben Schlappig over at ‘One Mile at a Time‘ that made the point that BA First class is the best business class in the air. Perhaps it isn’t even that any more? Next Post: Market Days? Swiss First for £2500 rtn.